Health care reform and increasing health care costs continue to drive demand for voluntary benefits- and for good reason. As the cost of health insurance rises, employers continue to struggle to control their company’s health care expenses. Pays cash benefits to your employees when they sustain any injury. Designed to help them handle medical and out-of-pocket costs after an accident or injury. Provides your employees the tools to cope financially if a positive diagnosis of cancer should ever occur. Critical Illness insurance pays a lump sum cash benefit to your employees when they are diagnosed with Cancer, Heart Attack, Stroke, Alzhiemers Disease and more. Benefit can be used for medical bills or personal expenses, the choice is theirs. Helps ease your mind knowing the financial future of your loved ones is protected. Coverage that helps with deductibles, copayments and other out of pocket expenses if you’re out of work for a hospital stay. Helps maintain a source of income in the event you can’t work because of a covered illness or injury. Dental Insurance covers some of the costs associated with routine dental care. Coverage is provided by employers or purchased directly by individuals. Vision Insurance is a low-cost way to cover costs of routine checkups and assists with costs for corrective vision wear. Do you understand how Voluntary Benefits works? 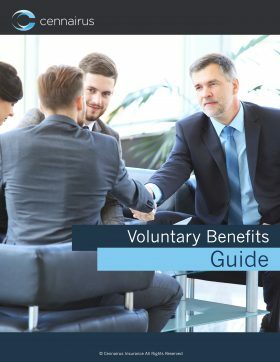 Download our Voluntary Benefits Guide now!